Meal Planning for Clean Eating: 7-Day Detox Challenge! Is it just me, or is clean eating pretty darn hard? I don’t peg myself as an unhealthy eater by any means, but I do admit I love to indulge when it comes to things like baguettes and French fries. I just love them! Meal planning for clean eating is probably the only way I can stick to a healthy week-long detox. When you eat clean, you increase your intake of whole foods such as vegetables, lean protein and healthy fats, and decrease things like added sugar, alcohol and refined grains in your diet. When you look at it that way, it seems like a no-brainer to eat clean. It’s definitely one of my goals as we head into 2017! Are you with me? Planning your meals ahead of time can make a world of difference. This way, when you do your grocery shopping at the beginning of the week, you can pick up clean foods and stay away from junk. I find there’s so much temptation when there are “bad” foods lying around the kitchen. I just can’t help myself. When your pantry and fridge are stocked with healthy foods, your options become clean eating, or…clean eating! It’s a great way to boost your nutrition for a healthy year ahead! Your shopping list should be filled with good, whole foods, while you say goodbye to your unhealthy vices. Some tips for shopping for healthy foods? Don’t go to the grocery store when you’re hungry. This makes it more likely for you to pick of foods you’re craving, which will likely be unhealthy. Make sure to check for added salt and sugars and stay away from foods that are processed. Pick things up you can freeze so they’ll last you a long time if you don’t use them right away. And always make a list! Going to the grocery store without a list is trouble. You’re likely to buy random things you don’t need, food you already have in your fridge but forgot about, and of course, you’ll be more tempted to buy the “bad” foods you love! Invest in a good set of portion control containers for easy, weight-loss friendly meal prep! Check out these clean eating recipes for a 7-day detox challenge! I’ve rounded up clean eating recipes for a 7-day detox challenge! Each day has a recipe for breakfast, lunch, dinner and two snacks. Rest assured that you will be totally satisfied throughout the day. Just because you’re eating clean doesn’t mean you’ll go hungry. And just because it’s healthy food doesn’t mean it has to taste healthy! I’ve included a number of recipes you can batch-prepare ahead of time. Take some time on Sunday to prep for the week ahead, so all you have to do on your busy mornings is reach into the freezer, warm them up and head out the door! I’ve made them as quick and simple to whip up as possible, with some more intricate recipes for those who love to cook! And if you’re looking for even more recipes for clean eating, check out the following cookbooks! Here’s our 7-day detox challenge to help you start off right! A 7-day detox doesn’t mean you have to deprive yourself of yummy food. It just means you’re filling yourself up with the good foods you actually should already be eating day after day. Check out how much variety you have, even with a detox, and get your clean eating started now! 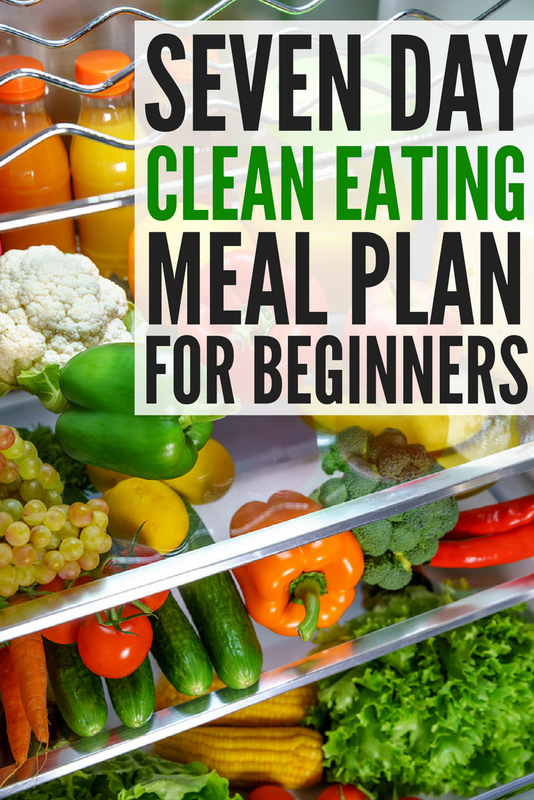 If you liked these tips on meal planning for clean eating, please share this post on Pinterest! And if you’re looking for more clean eating tips and tricks, please follow our Health board on Pinterest!